Pandora is one of my mom’s creations, a “sister from another litter” to Prada and Harper. I can’t resist this combination and keep coming back for more. 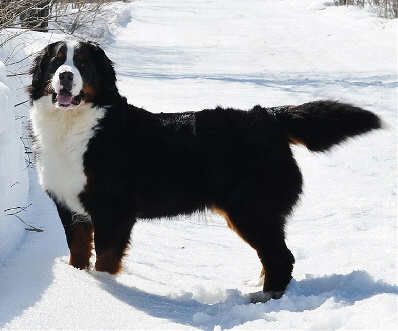 Usually, I get pick of the litter of what I consider some of the best Bernese in North America. Pandora was one of those selections. 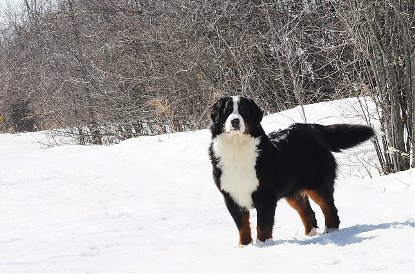 She is everything I look for in a Bernese in terms of structure, appearance, colour and personality. She has perfect markings and a perfect build. Pandora is puppy-like in her personality, although she’s a big girl now. She has lots of love and energy to give to everyone. She’s still boisterous, but will snuggle up to everyone giving them lots of licks and hugs. She loves the other dogs and will play in the back yard for hours. I like watching her throwing up sticks and pouncing on them, playing in the pond and chasing the other dogs around the yard. When she comes inside for some one-on-one time, she’s very calm, gentle and relaxed. She greets any visitor joyfully at the door, and is thrilled when kids come over. Like most Berners, she understands that she needs to be gentle with little ones. She’s got good intuition, and is also great with other dogs. 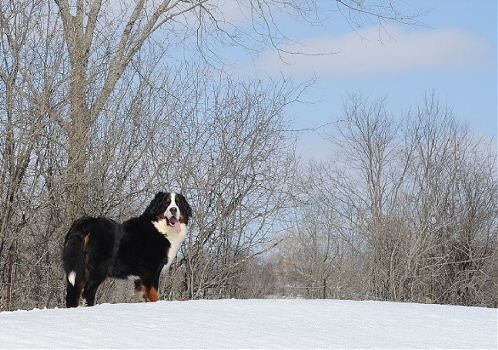 Her canine best friend is Maggie, a mini Bernedoodle. They are stuck together at the hip and just love one another. Pandora’s father is Dominique, whom we imported from a fabulous kennel in France. We waited about a year for this outstanding dog from these lines. 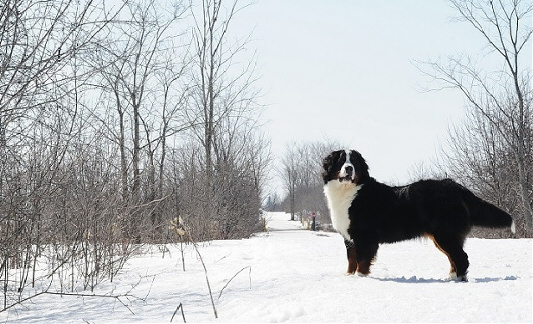 He is registered with the FCI in France and the Canadian Kennel Club (CKC). His father is a French champion, and there are many other champions in his background. Pandora’s mother is Nellar, who was also bred by my mother. 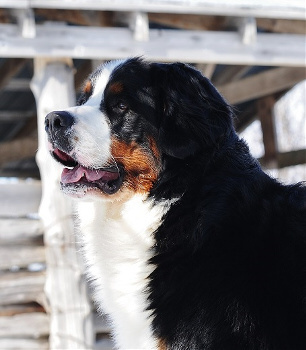 Nellar is a strong-boned female with excellent conformation and an outgoing personality. 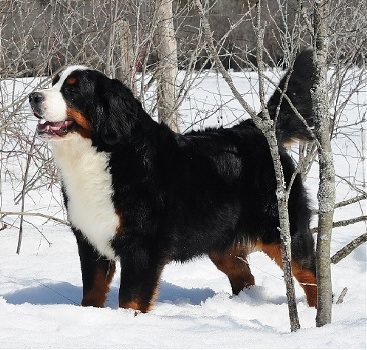 Nellar’s parents are European imports with long and impressive pedigrees. 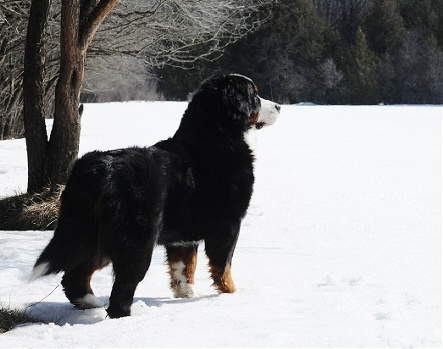 You can learn more on www.moorsbernese.com. As with all dogs coming out of my mom’s program, Pandora’s ancestors have been checked many generations back. 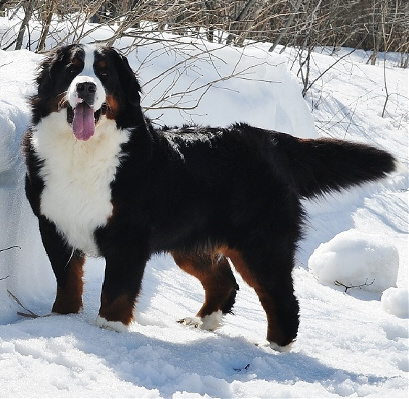 Her puppies will come from strong lines free of genetic bone disease, heart problems and eye problems.